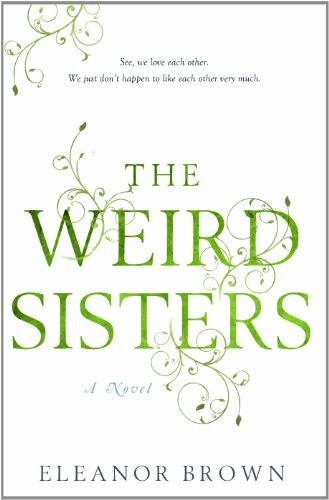 The Weird Sisters, by Eleanor Brown, was an absolutely delightful read. The story, as you might imagine, centers around three sisters who return to their Midwestern home for varying reasons. On the surface, they tell themselves that it is because their mother has been diagnosed with the big C. While this is obviously one of their reasons, it becomes clear as the novel unfolds that their true motivations for their homecomings lie elsewhere. Each feels she has failed at life in some way, and each seems to be simultaneously experiencing a period of personal turmoil, transformation and growth. The sisters' father is a professor of the Bard, expert in all things Bill Shakespeare. The family is one of readers, which I adored and of which I was in some ways jealous. Their house had no TV, and they were always reading in some haphazard way - picking up a novel here, setting it down in the pantry to be taken up by the next person to find it, etc. They had a habit of speaking to each other in conversation peppered with cryptic but usually poignant Shakespearean quotes - especially the father. Further following the Shakespeare motif, each of the sisters is named for a Shakespeare character that in some ways loosely maps out their personality. The oldest, Rose, short for Rosalind, from As You Like It; middle: Bean, Bianca from The Taming of the Shrew; and the youngest Cordy, Cordelia, from King Lear. Their personalities, their character's strengths and weaknesses, all seem to be shaped both by their Shakespearean character counterpart and where they fall in the birth order. At times, this seemed a little too constricting and obvious for character development (Rose was the reliable, responsible one; Bianca flirty and fighting for attention; and Cordy, the favorite, the baby, flighty and directionless), but in the end I felt it seemed to work. The book was written in the first person plural, the collective 'we' of the three sisters. This was rarely awkward, and I liked the device as it presented an almost separate character of a composite of the three. Oddly, while I couldn't fully relate to any of the sisters individually, I could relate to them as a whole. I was thinking, while reading, that in real life, I might not be friends with any of these women individually, but could see pieces of myself in all of them. In the end, after they do their respective growing up, I think we all would get along splendidly. Rose is held down by her attachment to feeling needed, her notion that she was the only thing holding the family together. She is a professor of mathematics at a college in the City (Columbus, OH), but it was not a permanent, tenured position. At 33, she felt she should have accomplished more than she had, and could not see that her need to be needed was actually a crutch holding her back. She is engaged to another professor, who takes a temporary job at Oxford without really discussing it with her (which bothered me), and after she is offered the 'job of her dreams,' a tenured position at the local, prestigious university, he is at the same time offered a 2 year position at Oxford. One or the other will have to put their career on hold... and initially, I did not like that it had to be Rose. However, Rose had never traveled far from home, had never lived outside of Ohio, her home state, and possibly needed to learn to take a few risks in order to experience all life had to offer. Who wouldn't want to go loll about in England? Well, okay, I'm sure there are many that would hate it. Even still, her husband-to-be did not seem seriously to consider moving back to allow her career to grow and prosper, and that was a shame. Although, it's probably incredibly realistic. In terms of character development, Rose learned to take risks and try new things, to venture beyond her geographical comfort zone, and that is important. I do wish some other catalyst, other than a man's career, served that purpose. Bianca is a 30 year old superficial flirt, on the surface. And a thief, it turns out, having stolen from her company by adding money to her paychecks (she handled payroll, so that's how that was so easy). Mostly, she suffers from the middle kid syndrome: she can't outshine Rose in the smartness and reliability categories, and she can't outshine Cordy in the everyone loves her naturally category. So she's left to be the impeccably styled femme fatale, making bad choices with men and deriving most of her self-worth from her looks and ability to attract a man's attention. Many women must be able to relate to such feelings, and while her character seemed to lack substance at first, she eventually evens out and shows the world and, more importantly, herself, that she has a lot more to offer than just a pretty face. She lucks into a job as the town librarian, one she resents at first as it's not at all how she saw herself. She does not want to be tied to the town she'd been so desperately trying to escape, and feels coming back, and staying, renders her a failure in some way. For anyone that's left their hometown for a big city, or several, these feelings of failure upon returning are wholly relatable. ...There are times in our lives when we have to realize our past is precisely what it is, and we cannot change it. But we can change the story we tell ourselves about it, and by doing this, we can change the future. Interestingly, I could relate to Bean's personality the least, but her predicament the most. I spontaneously moved to NYC straight after college, from the midwest, although I had nothing close to the lifestyle she chose (no fancy clothes and endless martini nights for me). I loved the diversity and anonymity of the city, the lively streets and public transportation, and fell for the illusion of endless opportunity. Unlike Bean, I didn't leave because I had to. I left because after 7 years, the non-stop nature of the city had become a constant drain on my mind and energy. But once I returned to the metro-area in which I grew up, I still felt a sense of failure that was incredibly hard to overcome. I had to come to the realization that the sisters' father so articulately states. It was that, exactly, that I realized, and what allowed me to move forward mentally. Cordelia, the youngest at 27, has been a bit of a modern hippie wanderer, never having a permanent address, wandering from temporary job to temporary job across the country, constantly needing money from her parents to bail herself out of her latest crisis. She doesn't even learn her mother is sick until weeks later - apparently she doesn't carry a mobile phone either. At this time, she has discovered that she is pregnant, by a man she barely knew and didn't want to continue knowing. Not that he's a bad person, he just lacked a worthwhile character, being an artist drifter of sorts himself. She seems the most innocent and carefree of the sisters, but she also feels the least capable. She doubts her ability to raise a child as much, and much more, than anyone else doubts her. Her main obstacle to overcome is her wanderlust - she comes to realize that returning home, having a permanent address, living a 'normal' life, is not such an awful thing, and may even be preferable. I really enjoyed this novel. I normally don't read anything that has to do cancer, but this book did not center around that, not really. It was not a depressing read about a sick parent - the mother was not the main focus of the book. The focus was on her daughters. Instead, this novel is more of a late 20s/early 30s coming-of-age tale. It deftly captures the modern ennui, focusing on that transition we all experience into 'real' adulthood. Most of us only feel as though we're playing at being adults in our early to mid twenties (or perhaps in some cases, perpetually). Life doesn't feel as if it progresses as neatly as our parents' lives appeared to unfold. We change jobs much more often, move more, are more likely to live in different cities, and are much more likely to view living near home as an indication that we have failed to make a claim in the world for ourselves. Valuing independence above all else can take it's toll. Unless we live completely on our own in the woods, make our own food and clothes and shelter and compose our own entertainment, none of us are independent, or completely self-sufficient - not entirely. And it's best to realize and accept our interdependence as a healthy part of life. I will admit that I glanced over the review because I like to go into some novels without the slightest notion of what may occur. I will say that I like your comparison of yourself and Bean's character, "I loved the diversity and anonymity of the city, the lively streets and public transportation, and fell for the illusion of endless opportunity." This statement reminded me of something one of my closest friends, who's attending law school in DC and is greatly missed, would say. I'm hoping that I can find the time to read this novel...never have time these days. I'm anxious to hear what you have to say about The Cookbook Collector, as well. Yes for some reason I felt compelled to keep writing and writing... not sure why. Ha, maybe that's what the combo of law school and a big city does to a person. It's a light and easy read - I'd recommend, although I know you have a lot on your plate already!